Well folks, this is it. After a year and a half, I’m bringing the Hot Pad of the Month series to a close. It all started with some random doodling, trying to come up with a hot pad shaped like a teacup, and is ending with a collection of 18 hot pad patterns, all based on that same original shape. I’m going to miss sitting down with my sketches every month, half the time going off book anyway, but I think it’s time to move on. I hope you’ve enjoyed this series as much as I have! There’s a lot of pressure when you’re coming to a full stop on a series this long. I wanted to make sure to end with something meaningful, and for all of us who sew, that machine that helps makes it happen is near and dear. It’s no coincidence that this is one of my favorites, and I could think of no better goodbye. This pattern uses foundation paper piecing. Rather than trying to explain that here, I’m going to refer you to this blog post where I show some basics and give you a couple of places to visit to learn more about the technique. Beware, if you haven’t trying it before know that it’s pretty easy to become addicted. 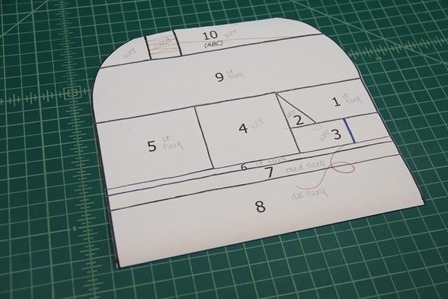 Cut pieces for each sewing machine section. I’m generous with the size of mine. It helps me prevent mistakes, so in the end maybe not as much extra waste as it appears. 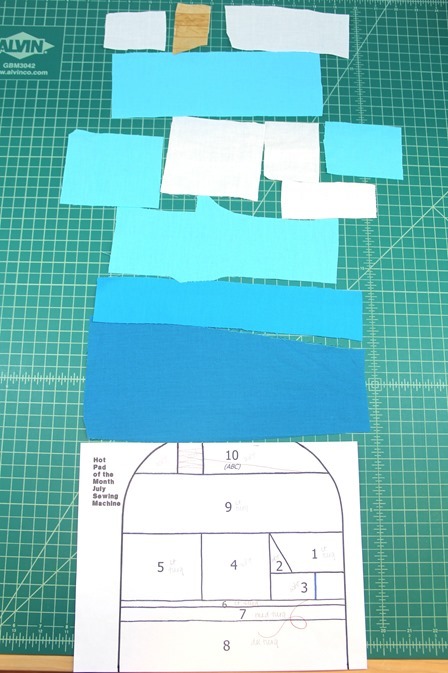 Starting with piece 1 and progressing in numerical order, stitch together the lower sewing machine section. The line on piece 3 is not a seam, but rather the embroidery line for the machine needle. The pattern prints backward so your machine will be correct when it’s finished. Leave the paper attached. Complete the upper section 10, starting with A. Remove the paper. Add it to the lower portion of the machine as piece 10. Flip over and cut around outer edge of pattern. 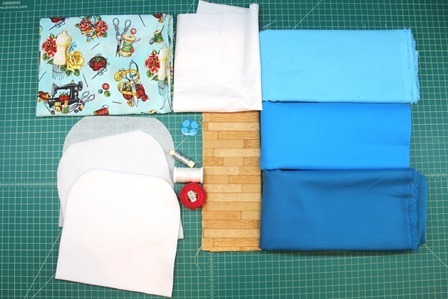 Apply the fusible interfacing to the back. This is just to add stability while you embroider. Trace the embroidery lines onto the machine with removable or very fine pen. It’s easiest just to print a second copy of the pattern for this. The thread lines are red and the needle is blue. I added my logo, but you can use your favorite machine name or any other word of your choice, or leave it blank. Embroider the lines using a basic backstitch. Because my silver thread was fine, I added a second line next to the first to thicken the needle up a bit. Layer the batting, InsulBright, front with the right side up and back with the right side down. Pin. Stitch, leaving 3” open at the bottom. Clip the corners. Turn right side out. Press, turning in the opening. Topstitch near the edge. Sew the button on by hand. I have to show you the back, only because I love this fabric so much. 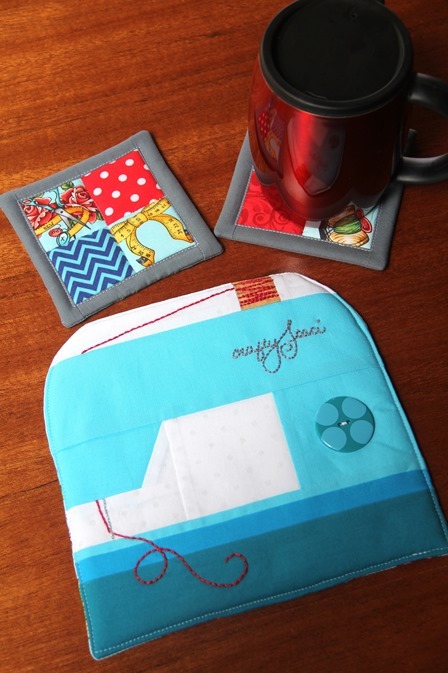 I’m not sure I can bring myself to actually set anything on this, so I made some four-patch coasters to go with it. Check back with me next week and I’ll show you how I made those with faux binding. I want these in all the colors. I feel pretty good about stopping here. What was I going to do after this?